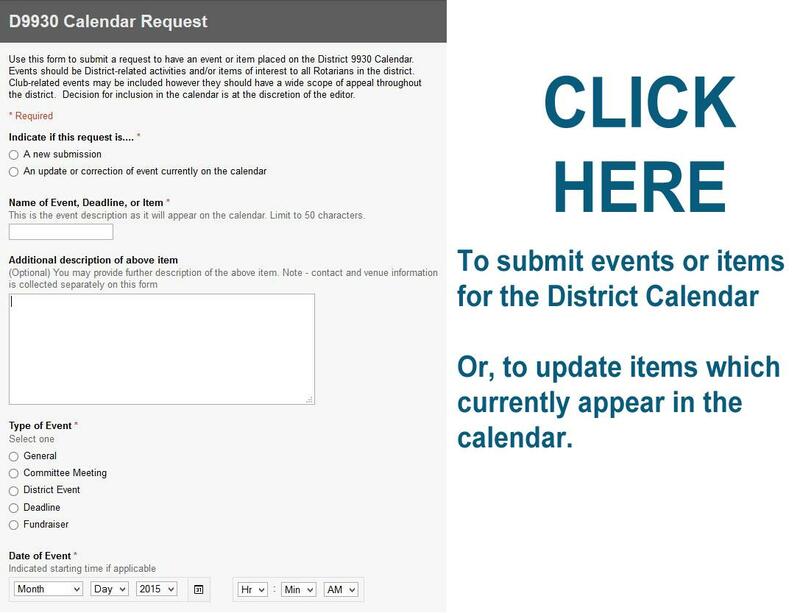 The DISTRICT CALENDAR is a key instrument in providing information about a wide range of important district and club activities. The calendar is an flexible tool that is constantly being updated and amended. If you are a district leader or programme chair, you need to know how to use this calendar. Adding an event or item, or updating an event, on the calendar is very simple. Just click on the image to the right to open a form which will collect the information you want to appear on the calendar. Items on the calendar can be updated, deleted, or revised at any time. Just use the same on-line form to record any changes. The District Calendar is intended to identify events that are directly related to district administration and district programmes. However, major club events of district-wide significance can be included on the calendar. For example, major fundraisers which draw from a geographicaly wide region are welcomed. All calendar entries are at the discretion of the Calendar editor. Please submit only events for which there is an assigned date(s). If you have an event with a "Date to be determined" you may submit the information but it will not appear on the calendar until you have advised the Calendar Editor of the specific date.